My family has been in the pool business for over 50 years. I started as a small child working summers and weekends. My full time career in the pool business began in 1976. 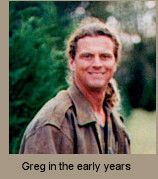 In 1989, with my third child on the way, I started Greg's Pools and Spas with the intent to build the finest constructed pools in the world. I feel we've accomplished that, with hundreds of pools all over St. Tammany Parish and the Greater New Orleans area. As a young man in the pool business, a client approached me about creating a rock feature, explaining that he always wanted one and had access to a large amount of beautiful Arkansas Moss rocks. The idea intrigued me, so I began studying and researching rock formations and successfully built my first waterfall in the early 1980's. Pleased with the results and now having these newly acquired skills and having access to about a 10 year supply of moss rocks, I began selling many stone or lagoon type pools. As my portfolio of stone work evolved, so did the demand of lagoon style pools. In the past 35 years I've created over 1050 swimming pools with about 450 being lagoon pools. Our philosophy is to build every pool as if it were our own pool. We use the best equipment, double the steel and more gunite than anyone in the business today. Over 90% of our business is referred. We are dedicated, reliable, and easy to contact - ensuring that our customers have a worry free pool building experience. ©Copyright 2009, Greg's Pools and Spas. This website created and maintained by iNET image, Inc. All rights reserved. Information subject to change without notice.